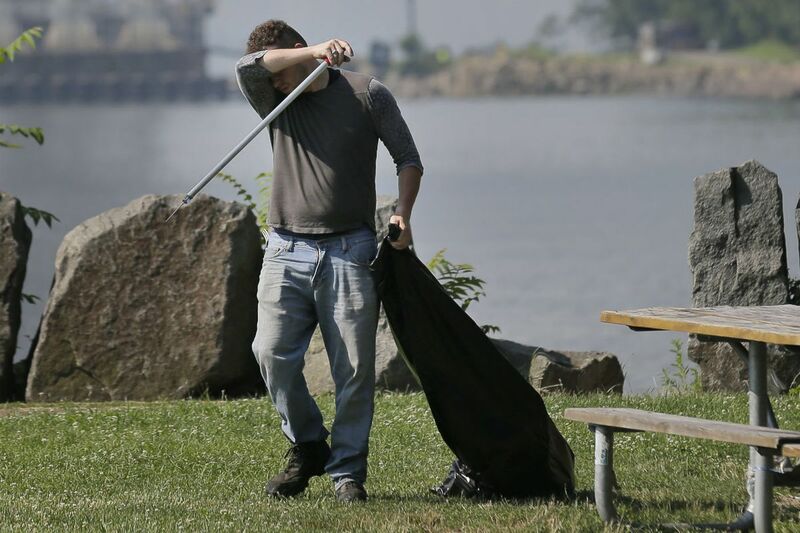 Robert Gidney, left, wipes away sweat while working in Palisades Interstate Park in Ft. Lee, N.J., Monday, July 2, 2018. The National Weather Service has most of New Jersey state under an excessive heat warning or heat advisory, with heat indices predicted to top 100 degrees. The victim was not identified, nor was it disclosed when the person died. Health Department spokesman James Garrow said heat was "a significant contributing factor" to the death, which occurred during the heat wave that began Saturday and peaked Tuesday. Meanwhile, after a high of 91 on Thursday afternoon at Philadelphia International Airport on a day with heat indexes in the upper 90s, the weather evidently is about to take a dramatic turn. Showers and thunderstorms out front of an approaching cold front are forecast to douse the heat wave Friday, and with the atmosphere ripe with water vapor, they could generate downpours that set off flooding. Thus the National Weather Service has issued a flash-flood watch for the entire region, saying that localized amounts up to 4 inches of rain are possible Friday morning and afternoon. Flood watch posted for entire region. After the rain shuts off, the weekend outlook is almost too good to be real: Sunny with temperatures in the 80s, and "heat indexes" that suggest it actually will feel a shade cooler than that.